Finding obsidian artifacts in Minnesota always excites archaeologists, since without any nearby source of the material, it provides clear evidence of long distance travel or exchange. (Much of the obsidian found in Minnesota has been sourced to Obsidian Cliff in Yellowstone National Park.) In a presentation on Nov. 9th, Dave Radford, DNR Parks archaeologist, announced that recent survey excavations at the new Lake Vermilion State Park have recovered the largest number of obsidian flakes ever found on an archaeological site in Minnesota, about 150 flakes. This is equal to the total number of obsidian flakes previously recovered at all the archaeological sites in the state and is the most ever found at a single site, however it should be noted that the majority of the flakes are very small. The excavators used 1/8 inch mesh on their screens instead of the standard 1/4 inch mesh. As an example of the difference the change in mesh size can make, they rescreened the material from their initial shovel test, which was originally done using 1/4 inch mesh. The first screening recovered 12 flakes and some fire cracked rock (4 of the flakes were obsidian). 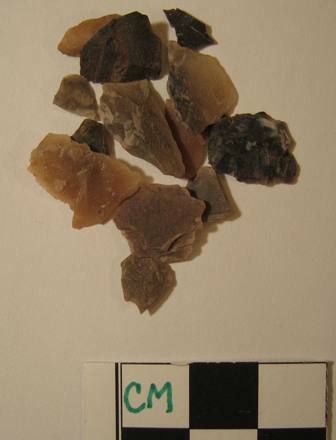 They recovered an additional 40 flakes, including 26 chert and 14 obsidian flakes, when they used the smaller mesh. (It should be noted that the numbers given are preliminary counts and final numbers will vary slightly. I’m also not sure of the accuracy of the notes I took during Radford’s presentation) The small size of the obsidian flakes suggests that they are the result of tool maintenance (resharpening tools) or from a late stage of tool manufacture, when a knapper is putting the finishing touches on a new tool. By count obsidian makes up about 20% of the lithic collection. 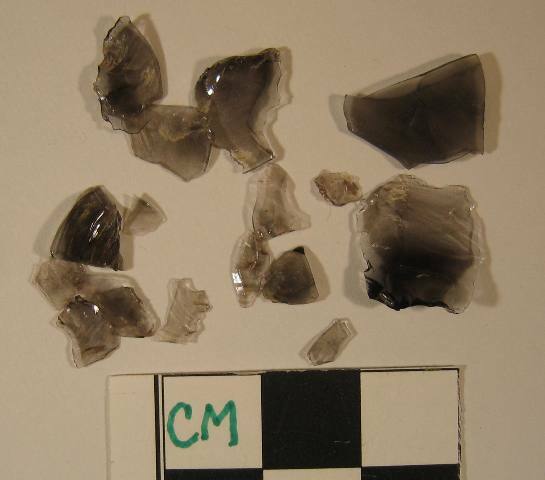 The use of obsidian in northern Minnesota is usually associated with the Woodland time period. There is a Woodland burial mound site only a few miles away where a small amount of obsidian has been found. However, one of the characteristics of a Woodland site is the presence of pottery and there has been none found at this site. This may be due to the small sample size from just a single 1 x 2 meter excavation unit and a f ew shovel tests. 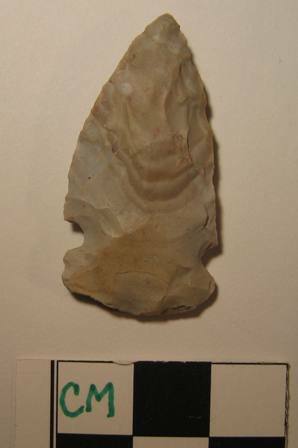 A side-notched projectile point was recovered adjacent to a hearth feature. It is made from Red River Chert and is not particularly diagnostic as to age. The point might be Archaic or Woodland in age. Enough calcined or burned bone was recovered from the hearth feature to obtain a radiocarbon date, so the question as to the age of the site will be answered. The obsidian will also be sourced to determine where it originated. What a discovery! Even at Silvernale I don’t recall us ever discovering any obsidian. I wish I could have made the lecture. Did Dave Radford bring any of the flakes with him for viewing? As for the new material, it’s a little hard to judge from the photo, but the golden with black bands material looks like a silicified sediment we find from time to time out in the Missouri River Basin. I don’t recall anyone out there ever having a real strong grasp on precisely where it was coming from. Like anything else not Bijou Hills, either carried in by man or by glaciers. The extreme variation in color between different specimen, however, is not familiar. About ten years ago I found an obsidian flake on the surface of an eroded mound of dirt located just upriver from the Pike River Dam where Hwy 1 bridge crosses the River. I think I found a two and a half inch piece of obsidian in a creek bed flowing into the Minnesota river near Chaska on 8/5/12. Is this an unusual find in Minnesota? Would this be naturally occurring or would it have been brought to Minnesota by Native Americans? I recently found what I believe to be an obsidian core (a throw-away baseball sized piece when all usable flacks are knapped off) near the confluence of MS and MN rivers. It was quite obviously flaked for arrowhead making. From my research, I believe the obsidian to have come to the area by trade. It was an exiting find! My brother found a cutting or scraping tool for the left hand made out of the darker black material on our farm near Hinckley Minnesota. Light passes through the thinner areas. 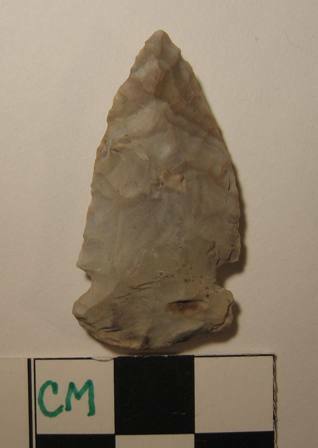 My late father also found a number of arrow heads as well. Three copper spear points were found nearby to. I found Obsidian on the shores of Lake Minnewaska in Glenwood, MN when I lived there as a young girl. The lake is a glacier lake that’s why you can find it there. I’m still a rockhound and have many gems but plan on going back there to look for some again.